Highlands are you ready for your $34k Insurance Bill? Sea Drift resident Claudette D’arrigo opened her NJ Manufacturer Flood Bill last month and was a little shocked. It was $34,526. First thought, Is this a typo? Third thought, this can’t be correct.. THIS can’t be correct… THIS – CAN’T- BE- RIGHT..
After multiple calls between the insurance company, FEMA and her mortgage company.. it was right. Not right in the sense of logical but right in the sense that they meant to send her that bill. She is now in discussions with Senator Menedez and there is a piece on Monday June 9 at 10pm on My9NJ Chasing NJ about how you do everything you’re suppose to do, lift above the recommended height for those extra insurance breaks and you still could get a HUGE insurance bill. 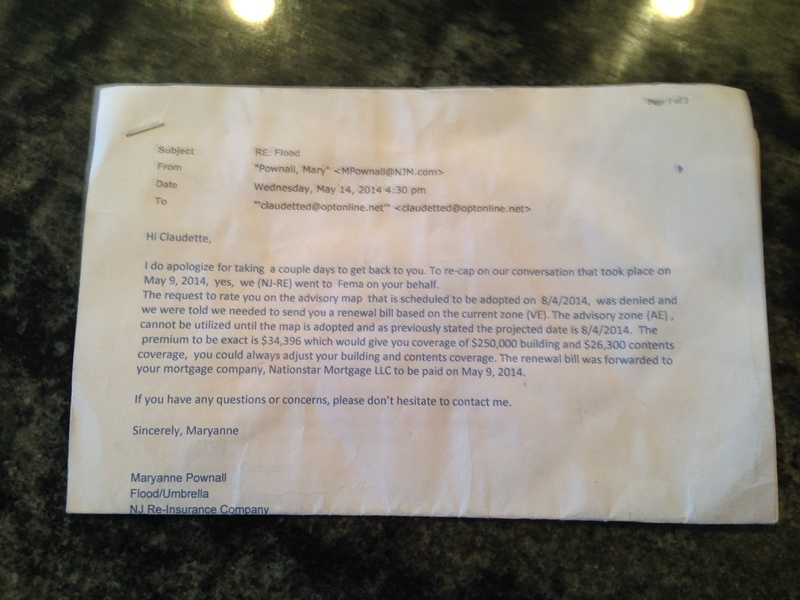 Here is the letter stating that her Sea Drift home is in a V-zone and the $34,526 premium is correct. And according to the maps before Sandy and the “new” maps after Sandy I am an AE zone & always was ! There’s something wrong somewhere. I got my flood renewal bill last month and it only went up a couple hundred dollars and shows AE. Why specifically are they using VE on this bill? I read the letter but it doesn’t cite any documentation to support their allegation; I agree with Claudette’s position on what the maps I’ve seen have said. FEMA has a lot to answer for. If there is anything I can do (tea/sympathy or torches/pitchforks), let me know! Thank you ! FEMA and NJM are trying to say that immediately after the storm all the Bayshore region was put to a V zone and until the “maps” are signed they insist hats my bill ! Of course the “illusive” V zone map was never signed but that doesn’t seem to matter to them ! Yes but Flood insurance still being subsidized as the Bigger Waters act was “temporarily” reversed so should not matter. See link below. But I have a question..did you elevate based on Sea level or ground level? We are 8.8 above sea level bit 4.4 above ground. I was told it was above sea level number? I’m so confused and trying to make smart choices. Does anyone know? This is very odd. I have Allstate and my bill was cut in half after we lifted. Also, I was a VE and since the new AE maps have not been adopted, our rate is based on the VE. Call Luis Ponce at Middletown Allstate. Good luck! Just paid all my flood policies sign the maps already. Instead of breaking ribbons for pictures the mayor seeing he’s so tight with the lieutenant governor he should work on a real issue .Another thought, if your flood company gives you the icc money based on your letter of compliance that’s saying you comply with the flood heights and design. Need to get Pallone involved email him he always gets back to people. The mayor? HA! Thanks for the laugh. After Sandy the state government wanted to open the town for SeaStreak commuters. The mayor ask for NOTHING according to Guadagno’s speech at the 1/1/14 reorganization meeting. The mayor couldn’t even bother to ask about getting our power restored. So if he didn’t care about the residents then, what makes you think he cares now? This page shows wording that can be used to send letter to FEMA & Officials if you were erroneously put in the new V zone. (apparently you aren’t the only one this has happened to). Thank you! Will try anything at this point! Saw you on @chasingnj Hopefully that helped 🙂 what can we *do* to help you? shades of bad things to come….. last one outta town turn off the lights!!! I had to have new construction due to a total loss (by a fire in March 2011) … and the home was built in total FEMA code compliance. Matter of fact my home is on the FEMA.gov website in their March 2013 release: “FEMA launches National Severe Weather Preparedness Week”. (Insurance Specialist /Senior Lender Compliance Officer /Federal Insurance and Mitigation Administration /DHS/FEMA) at several post Sandy FEMA meetings about our situation, and he recognized it was obvious that there is a major disconnect re: NFIP building code compliance and the interpretation of independent underwriters on how rates are to be properly applied. We also discussed with Jeff that the elevation certificate document submitted and used by surveyors needed to be amended and revised to reflect the disaster changes to properly include the many phases of the firm map process. Otherwise why in the world would homeowners invest big $$ to elevate for flood mitigation if the process did not give true relief in fold insurance? He agreed. We also had our Flood Plain Manager in Highlands write a letter confirming that our construction permits were approved based on 100% FEMA compliance … and that letter also confirmed our zone change from a VE to an AE (based on the post Sandy working maps which have now moved into the second phase of a firm draft). We were told by several insurance companies AND BY FEMA CUSTOMER SERVOCE that until the FEMA maps move into the ‘formally adopted’ category (estimated to be in 2015) that we would not have our rates show that we are in compliance. Meanwhile you cannot get a direct flood policy from the NFIP – you have to go through brokers. Every broker gives a different underwriter interpretation and a different quote value! This has turned into a convenient racket scheme by insurance companies to earn more profit on their commissions. Bottom line is that based on FEMA building codes and NFIP regulations all flood insurance quotes NO MATTER WHAT BROKER YOU USE should be the same .. there should be no discrepancies between one company vs. another. I thank STOP FEMA NOW for their job in advocating for individual homeowners, and for providing facts about the true hardship the federal agencies have created to the very taxpayers that pay for their existence. What you should do is get a second opinion from another insurance agent who specializes in flood. Send the new elevation certificate along with proof of prior since 2012. You may be getting rated improperly. A lot of times companies such as NJM employ people for quoting who aren’t even licensed insurance professionals. Its worth a shot if you haven’t gone down this route already but the documents above make absolutely no sense and you can save yourself a lot of headache if you go to a local agent. Thats a good point… I wonder how these people are employed? I spoke to Selective just to get try to get some idea of what rates are in area that elevated 13ft with vents, etc and was told the BFE is from ground level hence my question above. I actually had find and e-mail definition of BFE. I also spoke to insurance broker who knew nothing about grandfathering and told me that she knows from “inside” industry that Fema won’t be signing maps in August. NJM is still insisting that they are correct and they are insisting my mortgage company pay them. 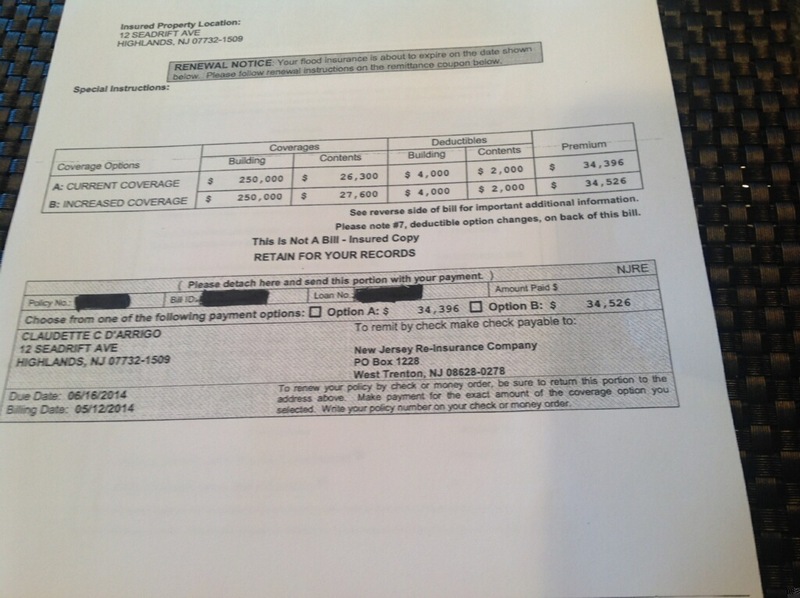 My mortgage company paid the initial renewal which was 1/12th of the $34,326 bill they sent. I am in the market to get a new policy, as was said by the NJM rep last night to Meghan my policy should be under $600. if anyone has a broker that UNDERSTANDS the NFIP I am open to suggestions. Amazingly crazy. Call Luis Ponce at Middletown Allstate (732) 671-2800 his email is luisponce@allstate.com. He’s been my broker for years and knows what he’s talking about. Good luck! I’d also reach out to NJDOBI, even though FEMA is federal, NJM is a NJ based insurance company, so pressure from the NJDOBI might help expedite.